Here at Westland, we take great pride in our restoration department, with a team of six restorers dedicated to returning items to their former glory. Using traditional tools and techniques whenever possible, the team undertake numerous projects varying enormously in scale and difficulty. Our wood restorer Tony has over thirty years’ experience as a cabinet maker and restorer, and usually works on our wooden chimneypieces, furniture and mirrors to name but a few. Tony started his career at seventeen after a woodwork tutor recognised his potential and put him forward for a job. After many years as both a maker and restorer of fine furniture, Tony joined our team and has since embarked on a variety of projects, but his latest has certainly been one of the most unusual! The project in question was the restoration of a monumental Regency urn made from grogged terracotta: a kind of weather impervious stoneware similar to Coade. This magnificent urn recalls the form of an Ancient Greek krater – a large vessel for mixing wine. The entire urn is dedicated to the God of Wine Bacchus (Dionysus), with a band of fruiting vines to the neck, underneath which is high-relief frieze depicting a Bacchic procession or thiasus, with revellers carrying cups of wine, bunches of grapes and the other trappings of a hedonistic feast. This urn is unlike any other we have come across, but echoes the popularity of themes from classical antiquity, made even more popular by the phenomenon of the Grand Tour during the eighteenth and nineteenth-centuries. 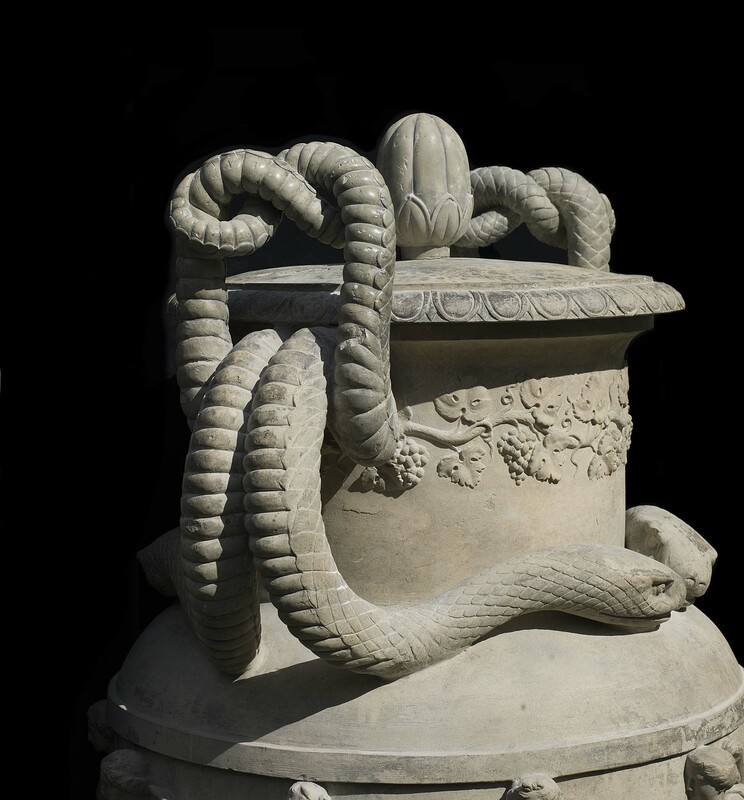 The great eighteenth-century engraver and antiquarian Giovanni Battista Piranesi even produced an engraved volume solely dedicated to the designs of urns in the antique style. The great architects and designers of the eighteenth-century widely adopted classical motifs and proportions, to develop a style which was the epitome of elegance. The handles are without doubt the standout feature of this piece. The four coiled serpents fashioned into handles are characteristic of Bacchic iconography, as Maenads – female followers of the God Bacchus – wore snakes in their hair. The top of the snakes’ curling tails which form the handles were missing, so after much research Tony embarked on their reinstatement. Tony explained that at times restoration is sometimes an interpretation and this is certainly the case with such a rare object, where no point of reference can be found. Initially, Tony began by making a maquette out of plasticine, playing around with the form of the tails. Once he was satisfied with the shape, he applied a resin in the rough form of the tails which, once dry, he could carve much like stone into the desired shape. When this carving was complete, Tony applied powder colours to match the new handles in with the patina of the urn. The joins are by no means invisible, and the repair is very much a part of the urns history. The finial on the ‘lid’ has also been reinstated, but the chips and other signs of wear have been left. For more information on this spectacular piece, please do not hesitate to get in touch or follow this link.